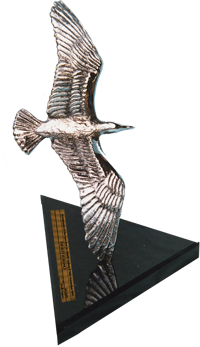 If you would like to support the Memorial, we have made available for sale to the public a limited Edition, 645 Silver Gull sculptures made from Soild Silver. Mounted on a polished granite base, cast in 98% solid Silver, each sculpture forms part of a Limited Edition of 645 sculptures commemorating the 645 men lost on HMAS Sydney 11 on November 19th 1941. These commemorative sculptures are offered at the special price of Aud $2,995 with one third of the sale price donated in aid of The Memorial, by The Rotary Club of Geraldton. They have been Valued at Aud $4,000 each and come with a Certificate of Appraisal from Odgaard Jewellers.